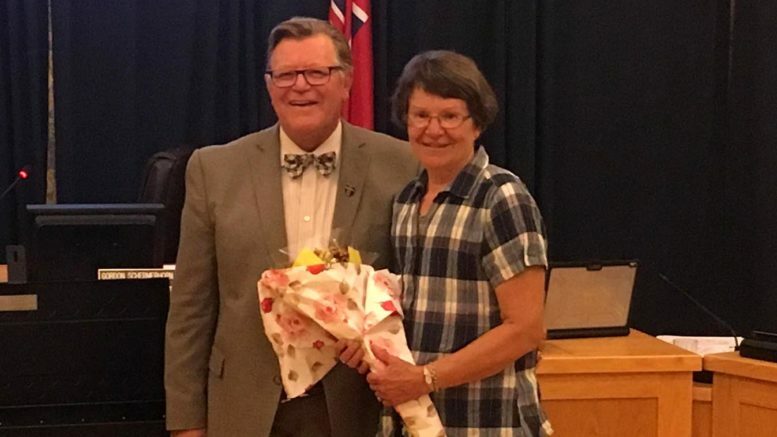 Outgoing Greater Napanee mayor Gord Schermerhorn and his wife Karen. Photo by Adam Prudhomme. A trio of outgoing council members-mayor Gord Schermerhorn and councillors Mike Schenk and Roger Cole, were recognized during Tuesday’s council meeting, which represented the penultimate meeting for the long serving members. A special presentation, which included a photo of his grandchild, was made to Schenk and his wife Lorna. 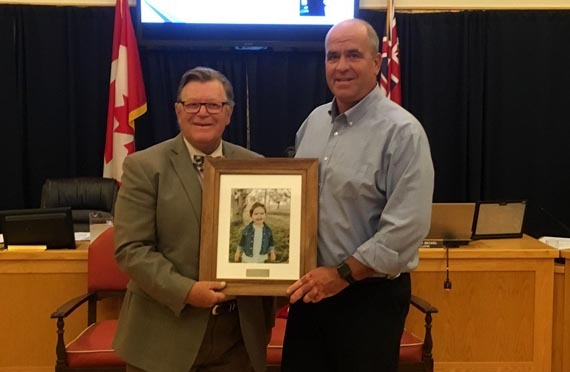 Ward 1 councillor Mike Schenk accepts the gift of a framed photo of his grandchild from mayor Gord Schermerhorn. Photo by Adam Prudhomme. Schenk also thanked the town staff for all their years of working together. 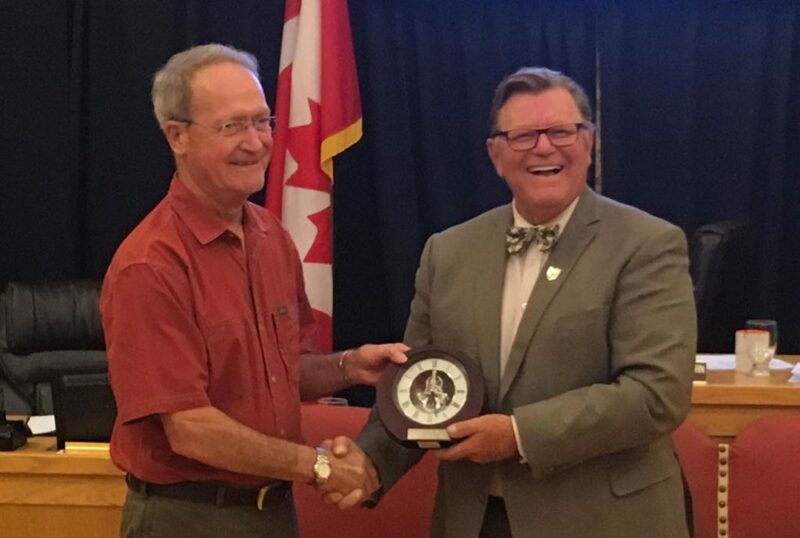 Ward 3 councillor Roger Cole accepts an engraved clock from mayor Gord Schermerhorn. Photo by Adam Prudhomme. Cole, a former school teacher, also sat on the Conservation Authority board. Cole, alongside his wife Marilyn, was presented with an engraved clock. Schermerhorn noted that Cole was actually presented the same clock earlier in his career when the town mistakenly thought he had served 10 years on council when in fact in had only been nine. Schermerhorn joked they took the clock back and were re-gifting it for this occasion. Deputy mayor Marg Isbester then made a special presentation to the outgoing mayor, which included a short video. Schermerhorn was joined by his wife Karen, who quickly reminded him they had been married for 46 years, not 45 as he mistakenly told the town hall audience. Schermerhorn was first elected as mayor in 2003 and was re-elected three straight times after that. He also served a reeve and deputy reeve of Richmond Township through the early 1990s before becoming deputy reeve of Greater Napanee in 1997. He also served as warden of the County of Lennox and Addington in 1998, ‘99, 2008, ‘09 and ‘14. He says among the accomplishments he’s most proud of is the many compliments he receives on the downtown revitalization.